Looking for a highly detailed tutorial on how to draw short hair? This is a very extensive one with plenty of examples, a full step by step tutorial and mini tutorial. It’s an expanded version of the mini tutorial from my first hair article. So if you’ve seen the thumbnail for this article before, I’m not feeding you old content. What you’re getting in this tutorial is new content with more images, more steps, more explanations and over 2000 words of valuable content! Let’s get into it! Grouping is a great way to approach drawing a an entire head of hair, especially if the sheer amount intimidates you. This method can help you draw hair faster because you’re simplifying something that looks complex. When you’re in the grouping phase, you’ll want to draw using very light outlines. These groups will eventually be broken down into smaller, more detailed sections of hair. In the grouping phase, all you need to think about is the length, overall design and flow of hair. If you’re drawing from a reference image, you can identify groups of hair by zooming out of the image or standing back to find patterns in the hair. Group hairs that are flowing in the same direction and/or close together. This part is self explanatory, but I decided to include it just in case. If you get the idea, move on to the next point. The order in which you draw each group of hair is important. If you’re drawing a hairstyle where the hair is prominently parted at the side of the head, you’ll want to start your first layer there and work your way out. The image below is an example of drawing from the part and working your way down the side of the head. If all the hair is brushed from the back of the head towards the front, start your first layer of hair from the back of the head where the swirl or whorl is located. If the hair is brushed from front to back, you’ll draw starting from front to back. If you have a reference image, look for patterns in the hair to find out the general direction where the majority of hair is flowing. In the image above, the hairs at the top of the head are all pointing in a similar general direction while hair on the side of the head seems to have a more unique flow. You can use arrows in your reference image to help visualize the flow. Avoid drawing hairs that follow the exact direction your arrows are pointing. You can make your drawing look a lot more interesting by pointing the hair in several different directions, while still appearing to point in the same general direction. Drawing hair isn’t about creating as many lines as possible. Between some hairs, there should be dark space. These dark spaces are important and can make a head of hair look more interesting to the eye and give the hair more volume or depth. You can introduce dark shadows in areas like the swirl behind the head, spaces between large groups of hair or even areas where overlapping, curly or unruly hair appear. If you’re drawing from a picture and you’ve lost track of which hair you just drew and you don’t know which patch of hair to draw next… there’s really no need to copy the exact picture hair by hair. If you end up reading through this entire tutorial, you will be more comfortable playing it by ear instead of pouring over the tiny details from your reference image. Below are just a few ways you can detail hair. You can incorporate a few or all of them in your drawing wherever you see fit. Come up with your own formulas. It’s a lot of fun! If you often find it hard to keep track of the overall lighting while you’re drawing, it really helps to plan ahead. You can do this by outlining/shadow lining areas of the hair you want the light to fall on or areas you want to have the most shadow and then shade these areas in. This step should be done before grouping and layering. You can easily change the highlighted section of hair by pinching your kneaded eraser into a long thin shape and swiftly remove graphite from your drawing. Have a good idea of where you want the hair to be lightest and where it should be darkest. Use a soft but sharp pencil to shade the darkest areas of hair. I used a 6B. If you don’t want such dark shadows, use a harder pencil. Make sure to use strokes that follow the hair’s flow. You can start drawing the individual hairs now. If you’re not comfortable with that just yet, see the mini tutorial from the original hair article. You can do this step with many pencils or you can use one. I usually draw one group of hair at a time. But in order to make this mini tutorial short, I’m working on all 3 groups at the same time. Using a 4B mechanical pencil, I created strokes that were bold to begin with, but ended lightly as I approached the areas I wanted to highlight. Then I used a sharp HB pencil to fill in some spaces. I applied a variety of pressures to get a mix of different values and line thicknesses. Some lines are shorter or longer than others. This is great, but make sure the area that you want to highlight has not been shifted. Now, you’ll want to draw from the end of the hair towards the highlight. If you draw the hair ends as dark as the root, the hair will have more of a curve to it. The thing you need to keep in mind here is that the stroke needs to appear as though both ends are faded out or thinned out. The way to do this is to draw each hair using 2 strokes going in opposite directions. You only need to do this if your hair ends are noticeably blunt, making them appear unnatural. If you haven’t been mindful of the prearranged lighting and your highlights appear to be off, use your kneaded eraser to redefine them. If you want the highlights to pop more, increase the level of overall darkness and/or use an eraser to brighten up individual strands of hair. If you’re still reading, you’re one heck of a patient person. I think you’re ready for the full tutorial now! Draw the shape of a head from the side. You can use this tutorial for proportions. Make sure to draw the ear and neck in this step as well. I used a 4B pencil so that you can clearly see my outlines. If you’re afraid of the outlines showing through in the end, use an HB pencil. Decide on the length of hair you’d like to draw. In this example, the hair is shortest around the back and sides, while the hair on top of the head is longest. Once you’ve decided on the length, grab a blunt 4B pencil and use the shadow lining technique to outline the hair. Make sure the distance between the hair and head is consistent. Erase any outlines that you made for the head and then use an HB pencil to create an outline that separates the hair on the side of the head from the hair on top of the head. If you don’t want to lose track of the overall lighting, use an HB pencil to shadow line areas of the hair you want to the light to fall on and then shade around those highlights. You can shade using a single tone or take it a step further and introduce darker tones. I used a blunt 4B pencil for that. 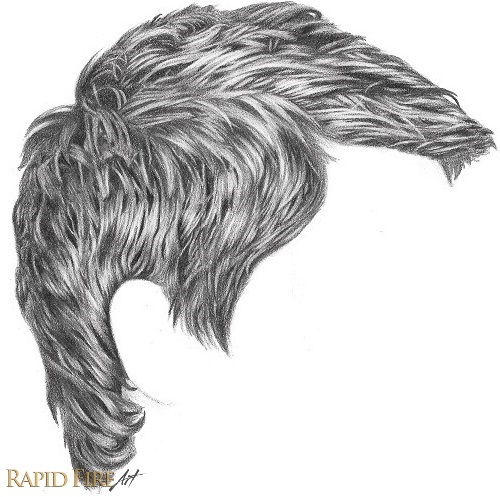 If you did step 4, use a 4B pencil to layer groups of hair starting from the swirl at the very back of the head. If you didn’t do step 4, use an HB pencil. Make sure you keep the overall direction/flow in mind as you draw. You can cover the entire side of the head or work section by section. I stopped as soon as I got close to the area I wanted most of the light to fall on. When you start shading, start by defining the darkest areas before drawing individual hairs (sharp 6B). If you happen to cross into the area you wanted most of the light to fall, do not introduce overly dark tones. 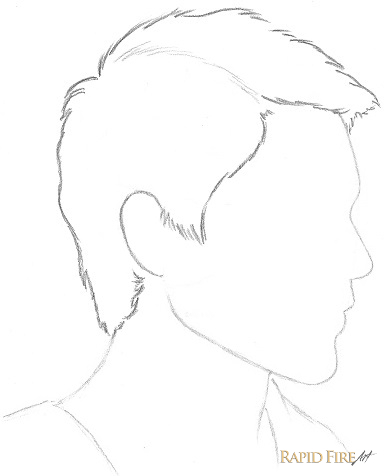 After you’ve defined the major shadows, start drawing individual strands of hair. Naturally, you’ll start breaking large groups into smaller groups and you’ll find ways to incorporate overlapping hairs and other unique and interesting patterns. For the individual hairs, I used a 0.5mm 4B mechanical pencil. Continue working around those highlights. When drawing hair at the nape of the neck, curl the hairs in towards the neck. For areas close to the back of the head that aren’t getting much light (the light source for your drawing may be different), focus more on mid tones and dark tones instead of trying to define highlights/shine. It’s okay if the hair doesn’t stand out. Working in small sections at a time, I drew layer upon layer of large to medium groups of hair. Working in layers helps me carefully plan out the hair direction and flow. In the image above, I shaded around major groups of hair, making certain areas darker than others to show some depth. Since this is the area I wanted the majority of light to fall on, I used an HB 0.5mm mechanical pencil and a 2B pencil to draw the individual hairs. If you’ve shaded too dark, or simply want your highlights to pop more, roll your kneaded eraser into a ball, pinch one section so it’s flat and sharp and then run the eraser along areas you want to highlight as though you’re drawing white hair. The image on the left is before erasing and the one on the right is after. In step 2, if you can recall, I wanted the hair on top of the head to be longer than the sides. The longest hairs you will have to draw will be in your first layer. The following layers are overlapped by layer 1, so they’ll appear shorter. Use your creativity to define shadows along random areas of hair. These might be areas that you’re not sure what to do with or that would have looked awkward if you did draw hair. You’ll know what I mean if you’re following along and applying this to your drawing. After you’ve drawn the shadows, use your mechanical pencil to break groups of hair down into smaller groups until they start looking like individual strands of hair. While you’re drawing the strands, improvise and find unique ways to incorporate unruly, overlapping, loose hair, etc. If you like this tutorial and want to see more in-depth hair tutorials, drop me your suggestions in the comments below! Question, is it hopeless to expect good/close results using any old pencil? Your parents made a mistake when they gave you a name; you should be called: Darling! thank you so much for your helpful teaching! Wonderfull it is very usefull !! Lv this tutorial…… I am Really happy in learning 3d pencil art using your tutorials…… Really once again I am thanking you for your help…..
i have used this tutorial, and about a dozen others, to try and draw the perfect face. i think i did pretty well but would love your feedback. How could i send it to you? Do u have to look at a photo when drwing or is it all in your head? I can’t draw without a photo and it stinks, how do u do it? Thanks Kori. When I shade, I usually draw by looking at several reference photos. I not very good at imagining how light falls on certain surfaces. As for drawing without a photo, I usually draw from memory instead of from my imagination. If you learn a drawing method really well (let’s say for drawing faces), it’ll be easy to draw without a photo because you’ll know exactly where each facial feature should be drawn. I have a tutorial which will show you how to draw an eye that has a single eyelid (here’s the link). I don’t have a full tutorial on drawing asian eyes though. I’ll add that to my to-do list. Boy, this to-do list is massive! Oh and regarding your last request, that one should be coming soon after I release the RFA Beginner’s Series (tutorials for complete beginners). While you wait, please feel free to email me and let me know what you’d like these tutorials to cover and any struggles you have which you’d like me to address! Thank you Rahul! Do you have tutorials for drawing African male hair? Not currently, but I can certainly write one in the future. Do you have any examples of hairstyles you want to draw? Thank you for this excellent tutorial.I just have to train myself now. Maurice. Thanks this answered the questions I had in the other (shorter) tutorial . The key is really at the start of Step 5 where you introduce the sharp contrasts and the very dark areas . My problem actually was that I was jumping from 4 to 8 so that a “realistic” grouping and strong strand contrasts were no more possible . This tutorial nicely shows that if the groups are not planned BEFORE (in Step 5) , then the rest will probably fail . A small question : if I wanted to link a picture here to show you how I applied your technique, what is the syntax to do so ? Thank you Darlene. Excellent piece of work. You have amazing skill. Thanks for the compliment Adele. I hope you got a lot of value from the tutorial! I am only starting to learn to draw so I will try one of your easier tutorials like the ear or so, but love the way you teach and all the information and support you are giving. Thank you so much for the time and effort you put into all this and making it available to us newbies. Much appreciated.